Murano island is the largest island in the Venetian Lagoon. 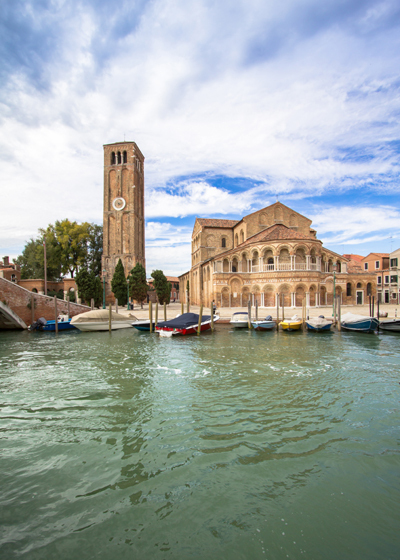 The main attractions of the island of Murano are the Church Santa María and its Palace Giustiani Glass Museum. Murano is known throughout the world for its art glass it developed in the surrounding of the 13th century. It is in Venice that were initially installed glass manufactures. In 1291 the Government decided to move on the island of Murano. Several explanations exist: fear of fires related to the combustion of the wood by the glassworks, desire to compartmentalize the secret techniques of the glassmakers, spontaneous grouping of glass? The master glass artists developed techniques that made the fame and wealth of the island. Murano became the capital of the glass and delivered the Royal courts of Europe to Constantinople. In order to preserve the know-how, the Venetian Senate threatened to death all glassmakers who versa or transmit his knowledge. Murano production decreased from the 18th century challenged by other glassware including those of Bohemia. Today the island of Murano employs about 5000 people in its glass. The production remains manual and very active in the beads. Murano glass is a lead-rich glass approaching the Crystal. It is particularly recognizable by the purity of its colors.